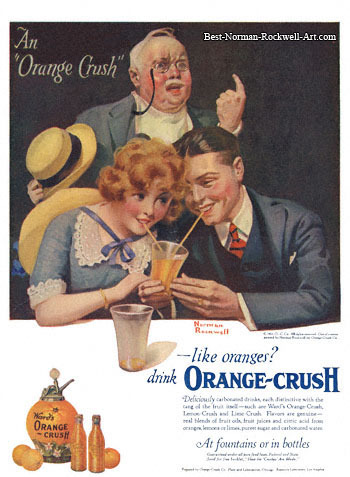 This Orange Crush advertisement featured a Norman Rockwell painting, entitled An Orange Crush. The ad appeared in the July 16, 1921 issue of The Christian Herald. 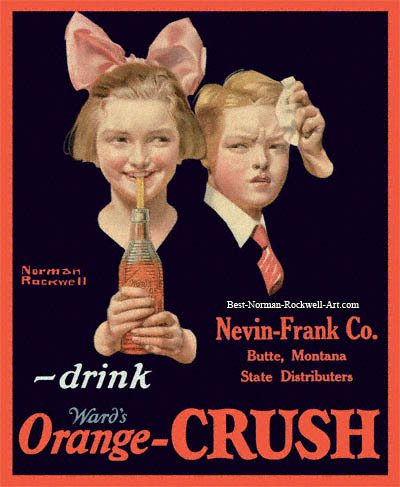 This illustration was one of most recognized Norman Rockwell Orange Crush advertisements. Reproductions of this ad are on sale at eBay every day of the week. It is much harder to find an original publication containing this ad. 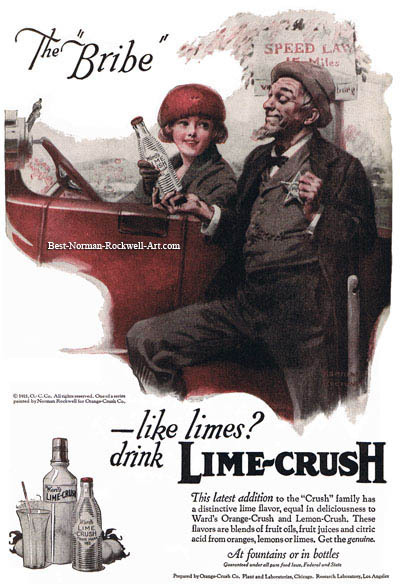 Rockwell painted twelve illustrations for The Orange Crush Company in 1921. He was apparently approaching the limits of his creativity by the completion of the twelfth painting. A young man and a young lady are enjoying a soda at the fountain. They are obviously enjoying each other's company. But they are also sharing a refreshing fountain soda with an orange tint. An older patron of the soda shop arrives. It is July and hot outside. He notices the young couple and their orange soda fountain drink. The older gentleman is sold! It's almost like the line from the famous movie: "I'll have what they are having!" Deliciously carbonated drinks, each distinctive with the tange of the fruit itself - such as Ward's Orange Crush, Lemon Crush and Lime Crush. Flavors are genuine - real blends of fruit oils, fruit juices and citric acid from oranges, lemons and limes, purest sugar and carbonated water. At fountains or in bottles. Guaranteed under all pure food laws, Federal and State. Send for free booklet, "How the 'Crushes' Are Made." 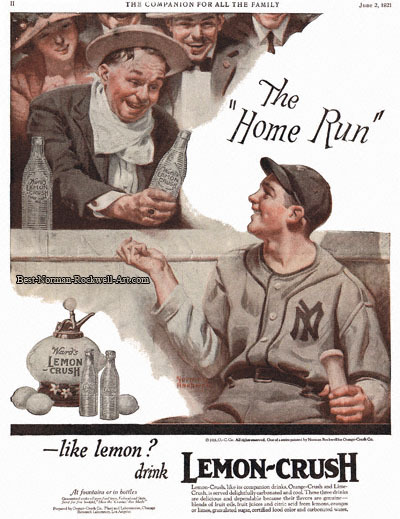 No doubt The company experiences exploding sales when Rockwell painted for the company.